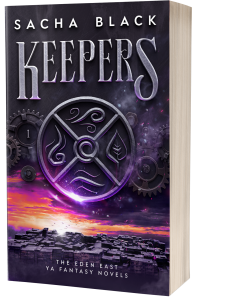 Keepers is the first in a six-book series: The Eden East Novels. Saving the world is easy: all Eden has to do is die. Seventeen-year-old Eden East’s life is perfect… until her soul is bound to her worst nightmare. Then her parents are brutally murdered, and everyone’s a suspect, including her best friend. As her world spirals out of control, a charismatic Siren, from a past she can’t remember, returns offering help, hope, and a heap of distractions. Eden must put aside her grief to solve the mystery of her parents’ murder. In a race against time, can she break the binding to her enemy before he destroys her and her world? To sign up for updates on the series and publication dates, click here. The Firmament is the first in Sacha’s second YA series. Based on popular conspiracies and set in a flat Earth dystopian world. To sign up for updates on the series and publication dates, click here.